Technology is a curse and a blessing. 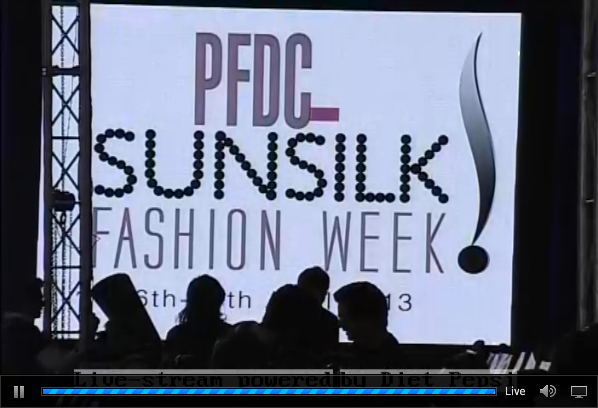 Who would know that I'll actually be sitting in Karachi, Pajamas and Tea in hand, in bed with my laptop, and reviewing the PFDC Sunsilk Fashion week 2013 happening in Lahore! With no worries about the bad hair day I sat and wait for the show to begin. The initial wait is a bit of a drag when you are watching a Live stream becuase you mostly end up being the only one there after the cameraman sets up!! I think I shall TRY to report it time wise. So Day 1 on the 26th of April has begun. 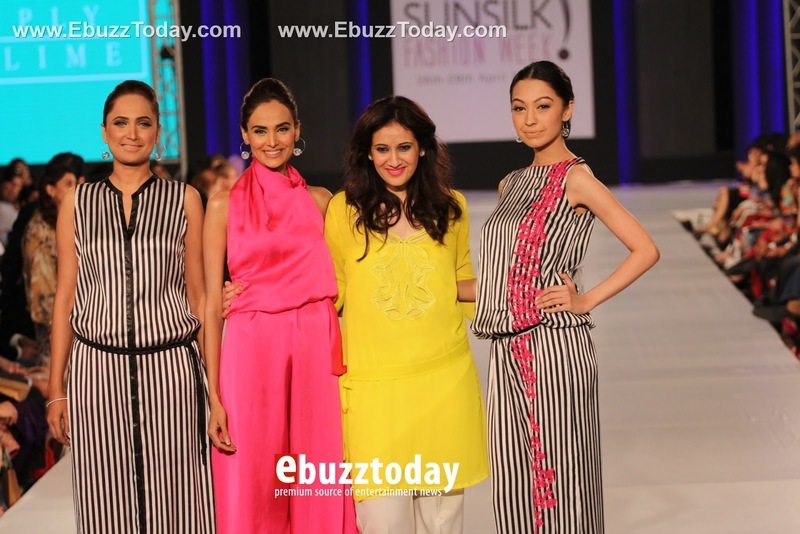 5:34 pm: Mehreen Syed talking about Fashion. 6:00 pm approx (cause I went to the bathroom so don't know exact time): The Lawn frenzy started. 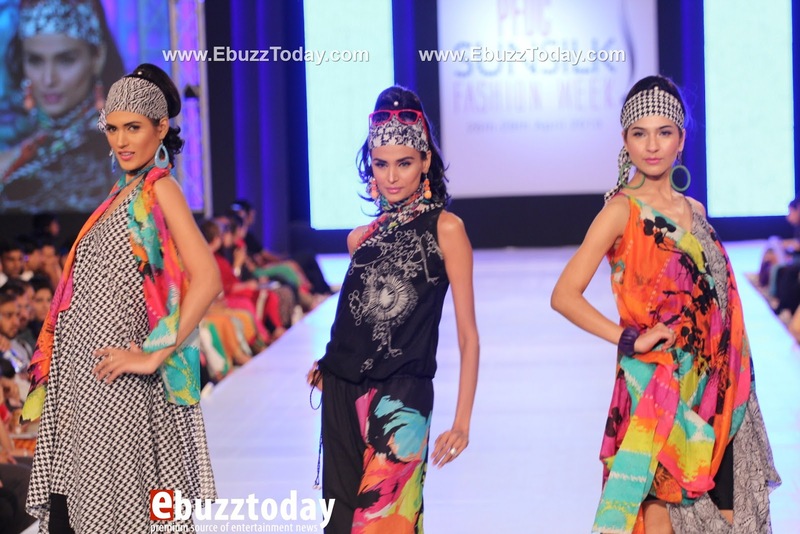 Pareesa by Chen One, followed by Kayseria (designer Waleed "HottyNeon" Khan) and Sitara Lawn. 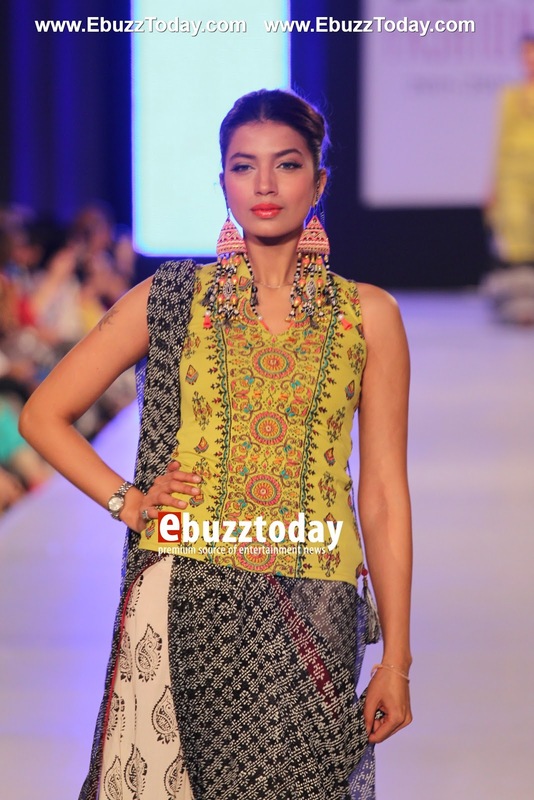 Pareesa prints looked a bit tribal before I could really focus on them and then floral, neon color mish mash came into focus. 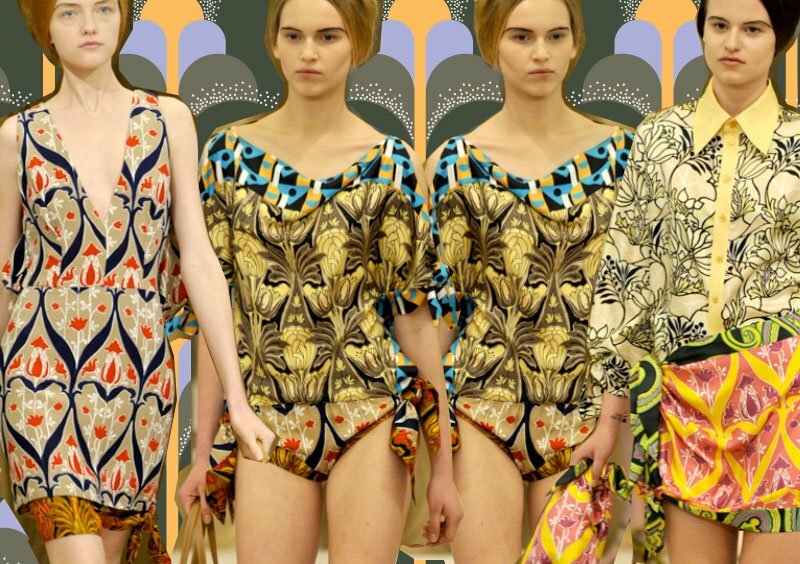 Some prints reminded me of the recent Roberto Cavalli Resort 2013 campiagn. Now I am NOT saying they copied him, I just sort of thought of his clothes when I saw these, thats all. Maybe thats a good thing becuase I might just buy a print and make a jump suit out of it. Overall the burst of collors with contrasting geometrical small patterns. Nothing unique about the prints, not saying they were unworthy of buying either (considering out of the whole lot of designers in Fashion week most people end up buying lawn, not just becuase they like it but becuase thats the most affordable). 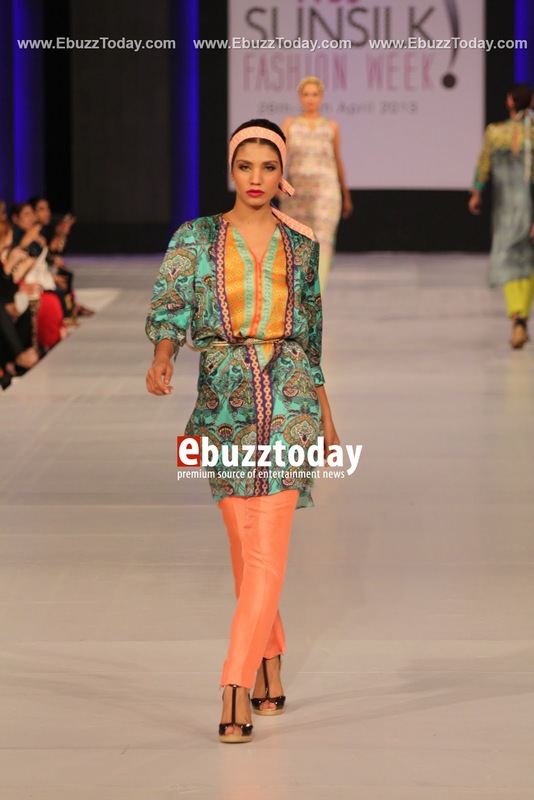 Sitara Lawn started off with there presentation on the screen claiming the inspiration "following the global trend" and Color burst. 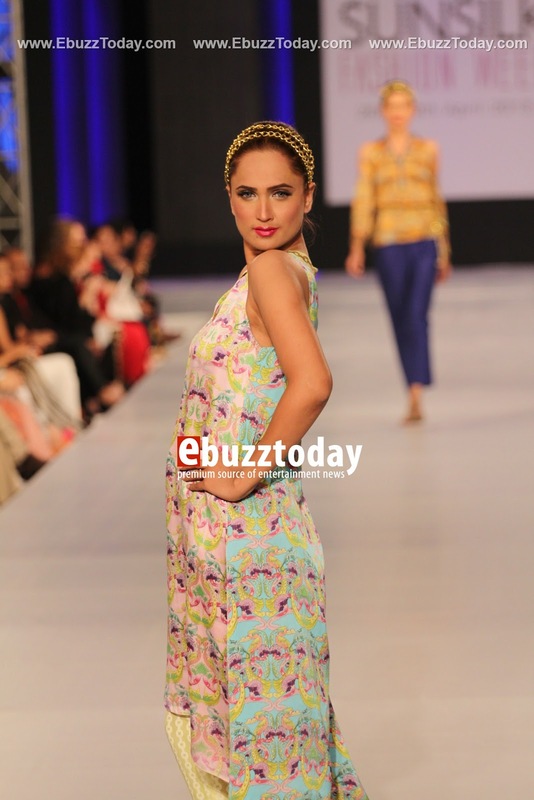 I didnt see much, or maybe after a while the lawn was just the same old blur of floral OR paisley prints. and I swear I feel like some designers (mainly the lawns) sat together in a room and discussed how they can do something "Inspired" by Cavalli and a little Prada from last year creeping up . . . Seriously! maybe I just need to rest eyes and take a break from lawns? 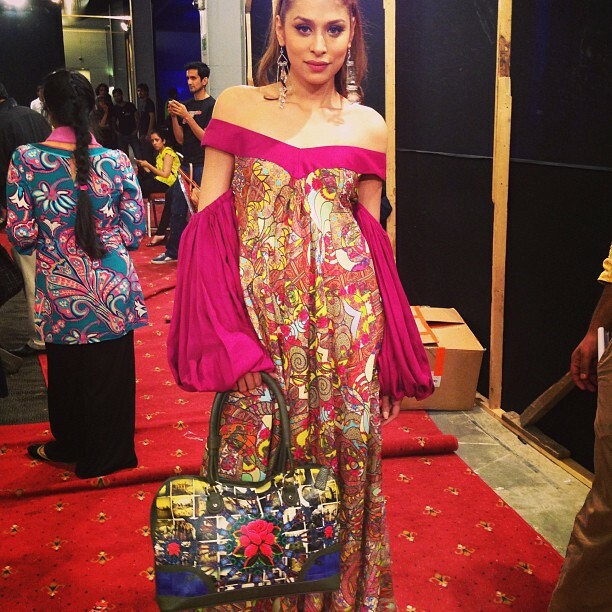 8:30 pm: Show starts with Tapu-Licious Bags and scarves. 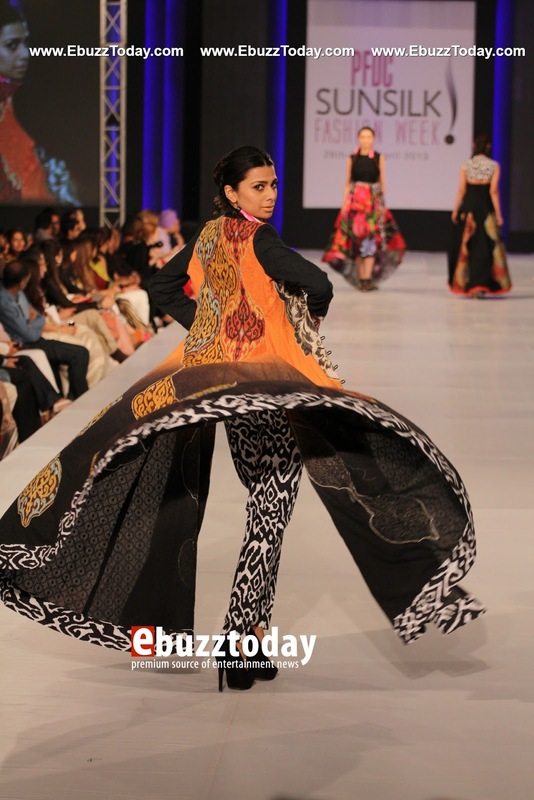 The collection of clothes to compliment his bags was done by Rizwan Baig and Wardh Saleem. 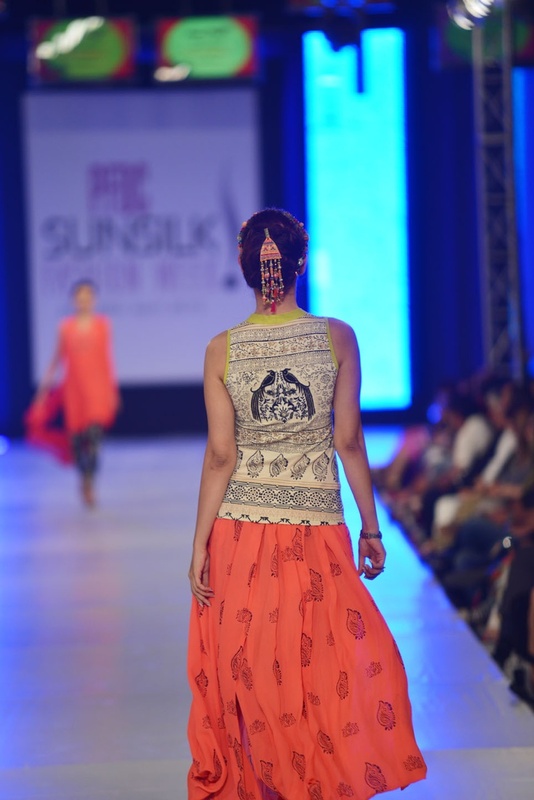 The prints used for the apparels were digital prints by Tapu himself. The collection was eye candy.I could actually notice how the Kara-Chakra Photomanipulation series have evolved into more refined Pop-arty florals and geometrics. Tapu-licious has matured, very refreshing. The clothes were a delight, starting with simpler, monochromatic prints and silhouettes and transgressed into more burst of colorful kaliedoscopic and layered prints, textures and layers with complimenting bags and clutches. 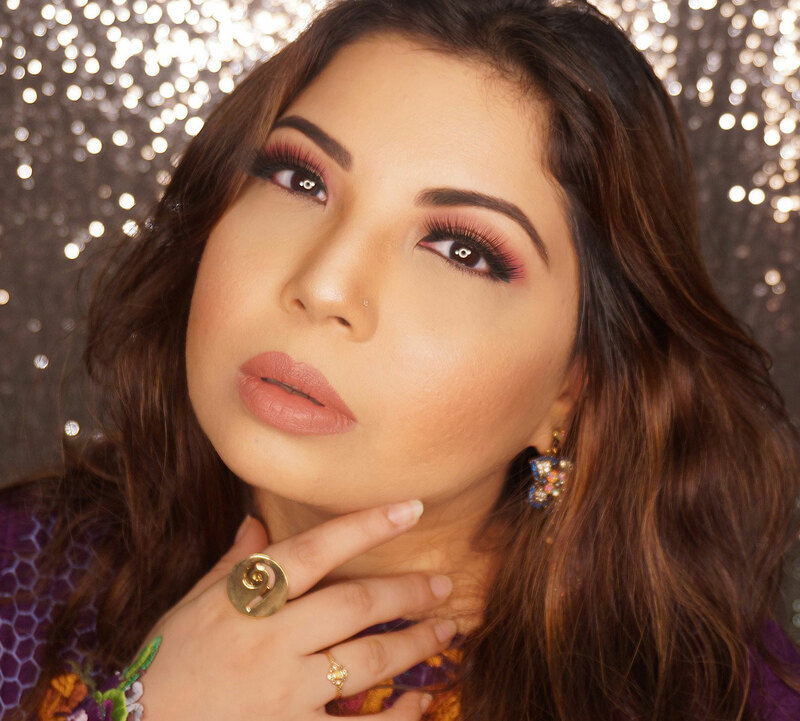 Misha Lakhani's Luxury Pret collection comprised of mostly digitally printed silk, transformed into loose-fit summer dresses (with her signature cinched drop waist) and sari drapes. 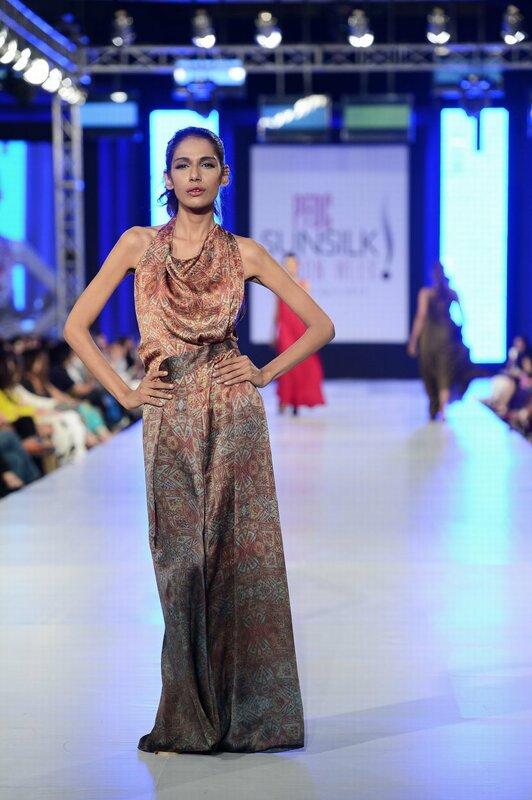 The prints were inspired by the mughal architectural decorations and patterns. They looked like a mosaic mesh of geometrical and floral prints, overlaying and creating gradients throught print and fading shades. Even though the inspiration was mughal I saw glimpses of Renaissance and over all draped cothing was very Roman. It said Roman-Chic to me more than Mughal. She took geometrical patterns a step further by fusing them in her cutwork appliques on net which were mostly used as drapes. 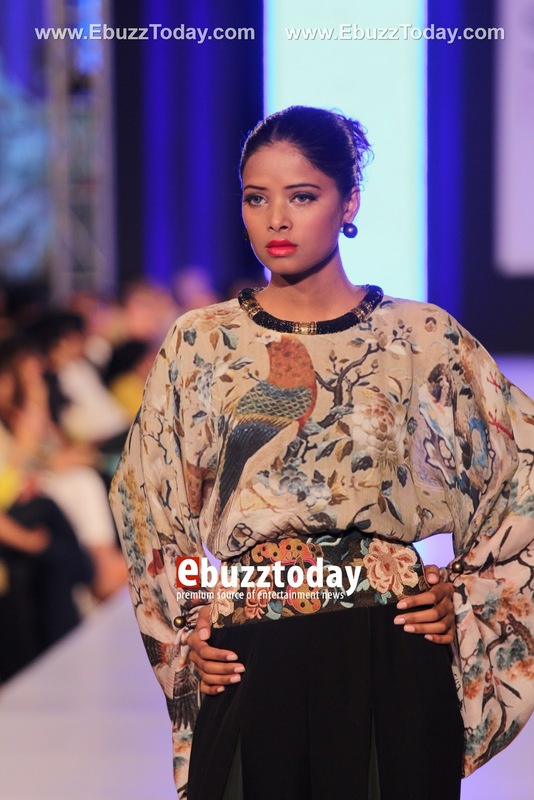 I didnt mind the Ombre-effect, mosaic printed jumpsuit worn by Faiza (shown below). 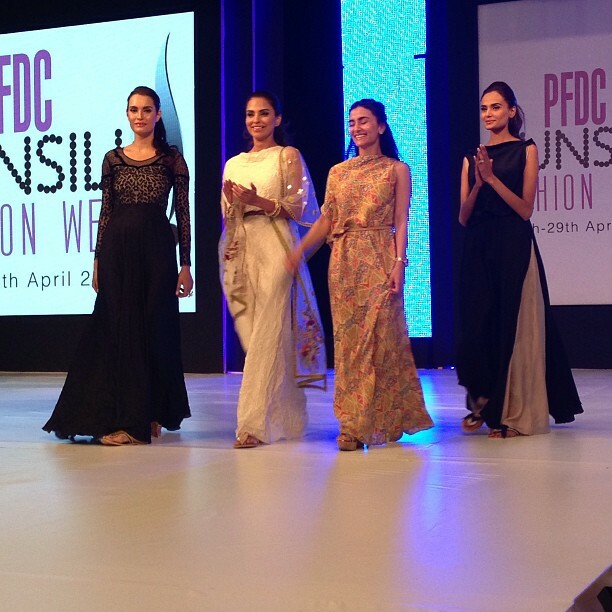 FNK Asia's SS2013 collection was inspired by the lush rain forest culture of Bengal. FNK Asia is usually a cutting edge version of traditional / cultural prints and design and here they followed the same philosophy. 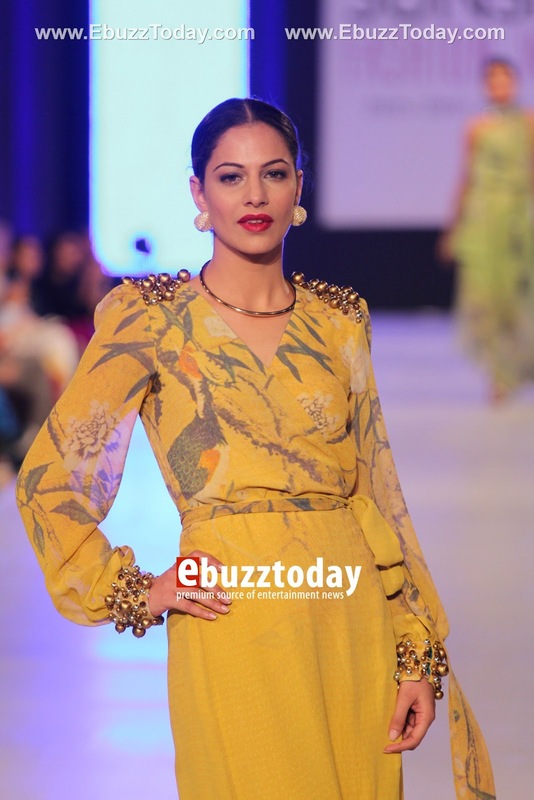 The collection overall seemed like a palette of spices, Garam Masala to be more precise.The sleeveless crop tops (as low as they can go in Pakistan) was a first here (or the first I have seen so far), keeping the global trend of cuts in mind. Block prints-like fabric, fitted tops with flowy loose bottoms and vice versa. Contrasting colors paired with mostly monochromatic prints. The casuals advanced into luxury pret with loosely draped, lightly embellised Long shirts. 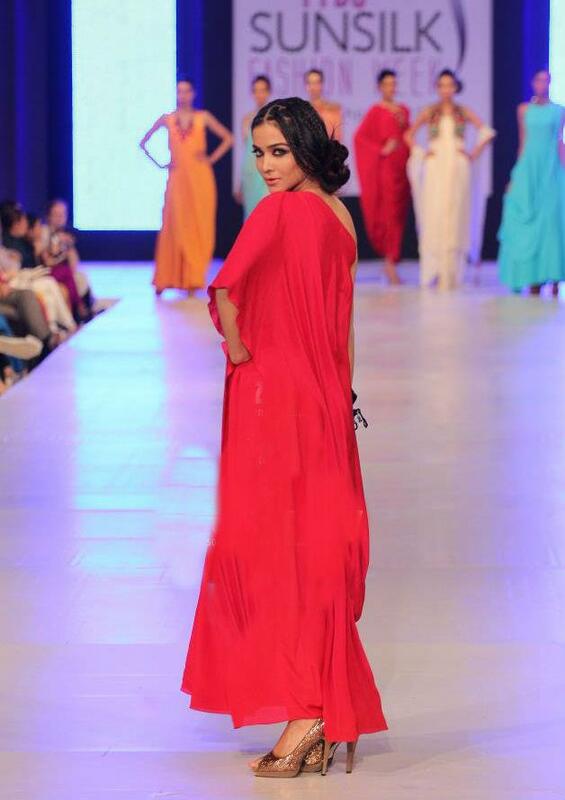 Umaima Malik was the show stopper in a bright red, one shoulder, long shirt. 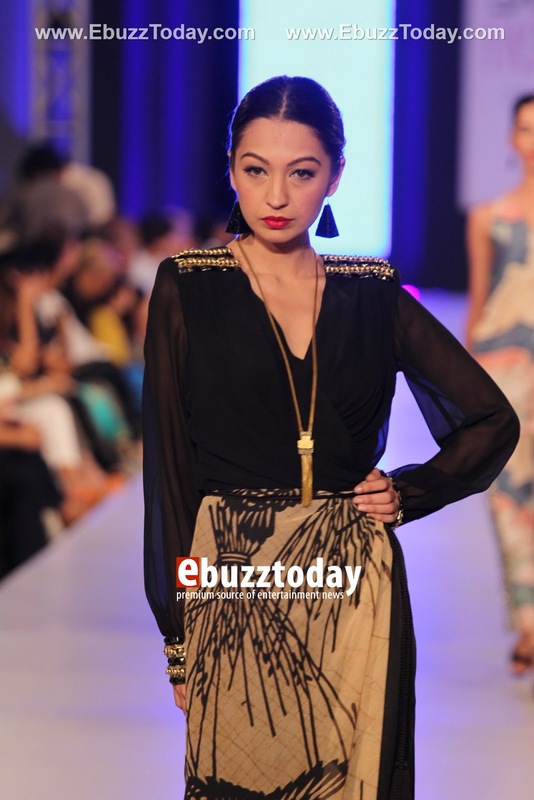 Elan by Khadija Shah was up next. Her inspiration was chinese imagery wrapped in romantic poetry. 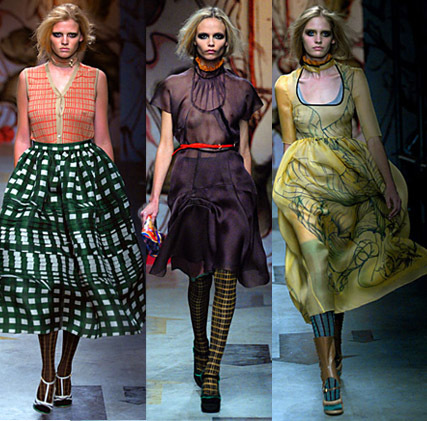 The prints complimented by soft, almost translucent, layered fabrics donned by the models did look like painted poetry. The overall color palette was muted tones of yellow, watery blue and pale greens with stark black.. I could see the reoccurring elements of birs, fish, flower blossoms, a typical chinese scenery . The overall loosely structured dresses were a mix of kimono styled wrap tops, bubble hem line and billowy tops with cigeratte pants. I admired the used of statement jelwery and embellished, thoughtfully crafted shoulder embellishments and cuffs. It was just right as she understood the idea that a little goes a long way. 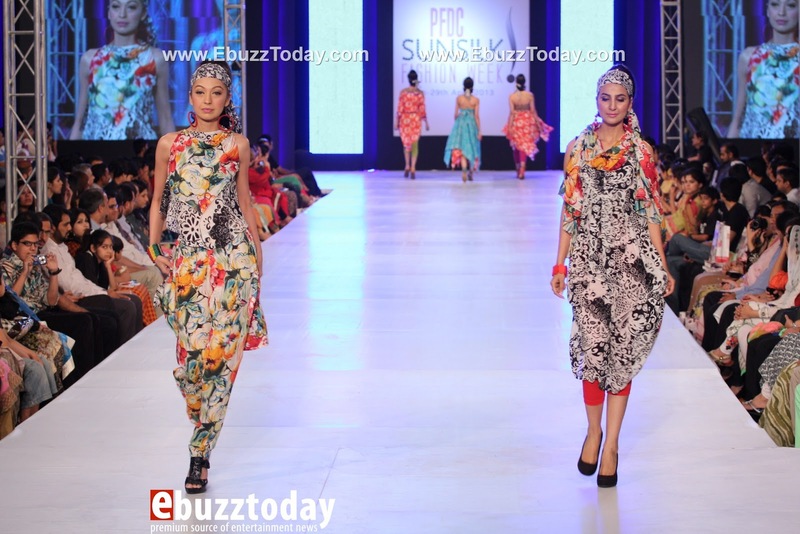 Sublime By Sara Shahid was a collection of mostly neon apparels with a mix of floral bohemian-like sun dresses in between. A minimilistic brand by nature, Sublime wanted to add some funk and feminity this spring but other than the neon colors being used the funk was not apparent. The collection was just a smooth sailing of color blocks after color blocks, with occasional florals to break the monotony and the two monochromatic striped pieces in the end. There wasnt any "wow" moment for me. It was a safe collection. 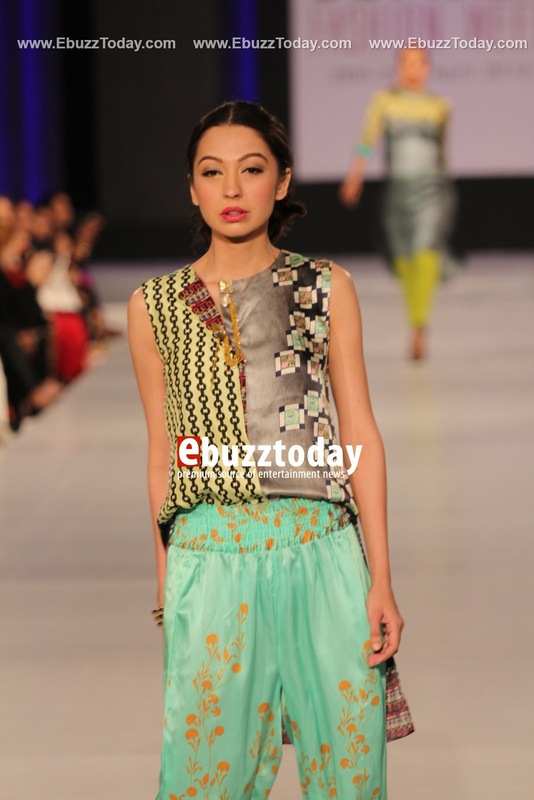 Akif Mahmood showed his collection inspired by the art of collage. His collection did stand out from the rest, mainly becue of a different, darker yet vibrant, pallette and stark motifs and prints. Akif’s concept behind this collection is to fuse various prints, textures and embroideries to create a composition in the form of a garment. Akif has mixed colors, motifs and different patterns together for this collection across fabrics such as pure cottons with textured embroideries.The patterns used looked like Alphonse Mucha was reborn in the retro era and created these while smoking weed. 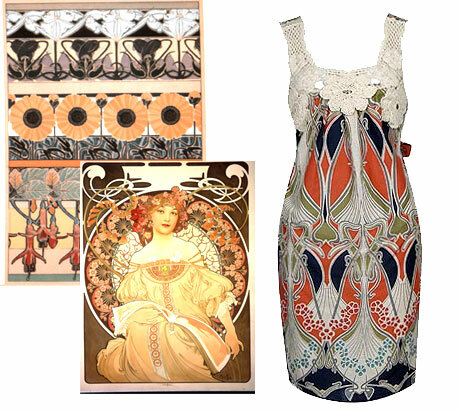 I saw a a lot of Art nouveau in his work, its one of my favorite art movements. 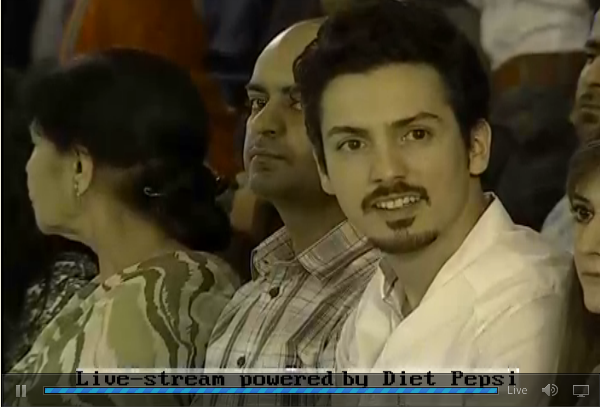 Other than Tapu, Akif also got a "Like" from me. 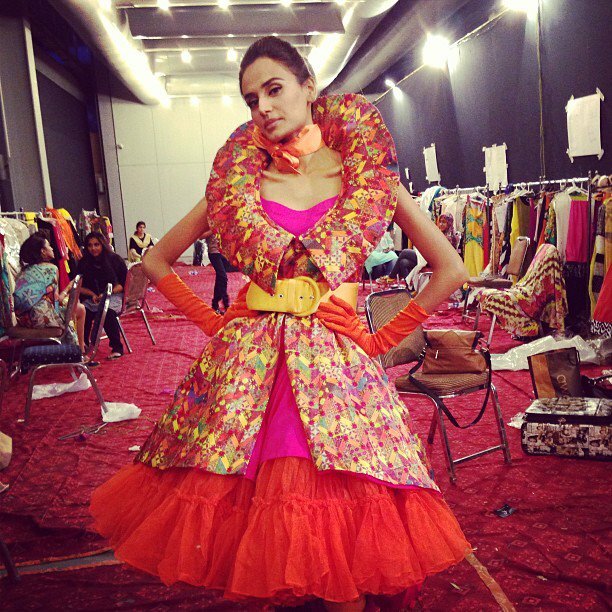 Sania Maskatiya's Lahore collection was definitely better than the one I saw in Karachi earlier this month. ‘Ahgaaz’ Resort 2013 collection is inspired by the craft and motifs of 19th century Persian, Middle Eastern, Hispanic and Italian Renaissance ceramics and tiles. Blending powerful images of dragons, serpents and birds with bold geometrics and floral’s into the warmth of rich hues and calm pastels, we enter a garden of dreams and perilous new beginnings. Using a variety of fabrics such as raw silks, crepes, chiffons and shamoses, embroidered and digitally printed fabrics and screen prints with contemporary structured silhouettes, the collection seeks to excite your senses as you enter the garden of new beginnings. Her use of "digital" print in maturing with every piece she is making and its apparent. 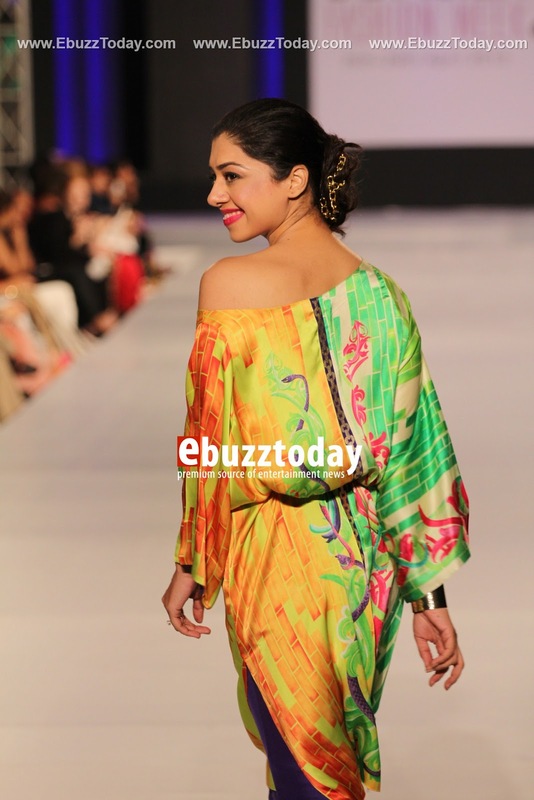 This time I liked the experimentation of fusing more than just two prints in one outfit. The color combinations were unique and refreshing as well. an overall impressive collection. 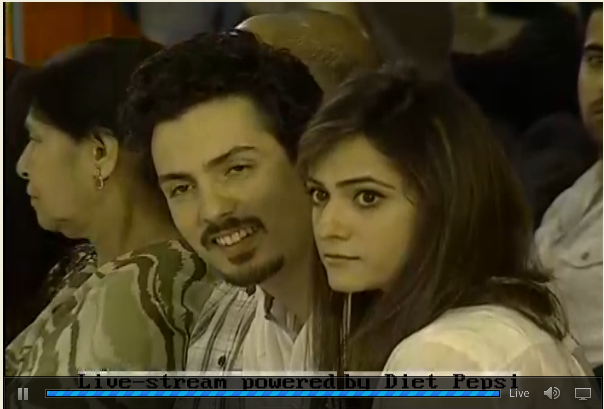 After a break of 10 to 15 minutes came the first day first show grand finale by Maria.B. 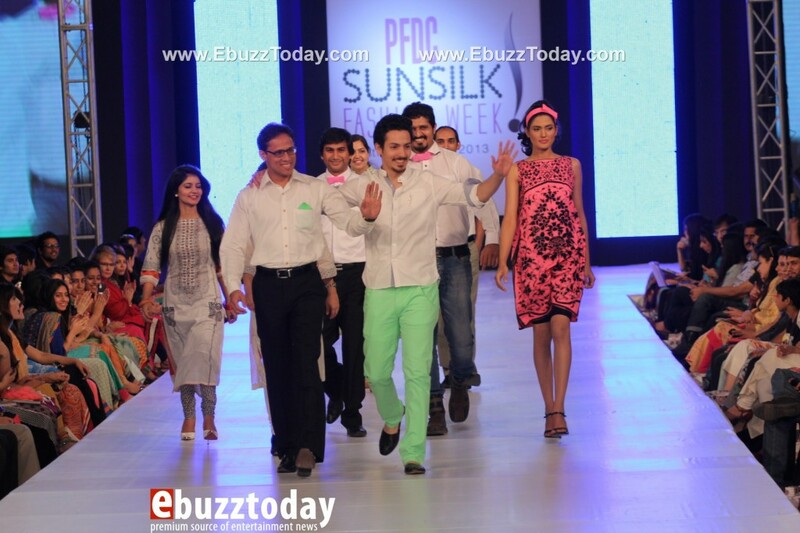 Her Spring/Summer 2013 collection for PFDC Sunsilk Fashion Week titled ‘The Sunshine Collection’ is inspired by happiness, joy, innocence and youth. The colour palette is bright candy colours in hues of corals, pinks, tangerine with hints of aqua marine and lemon yellows has been used to come out with a clean silhouette combined with flattering volumes. The emphasis is on bold prints and asymmetric, modern patterns that forms the soul of the collection has been designed using pure cottons, Khaddars and hand printed silks and hints of embellishments and high – impact wearable accessories. Overall the collection was fun and wearable but not the best of today's lot. The jewelry was a definite win. I like a few pieces which I have showed below. The grand finale was not so grand for me but my sister pointed out that her clothes are amongst the most wearable in the market. So Maria. B gets full points from sales perspective. The show finally came to an end. 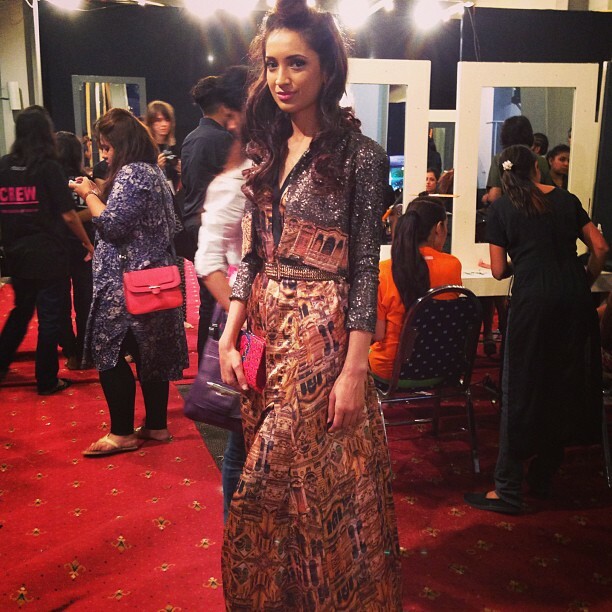 Overall styling was simple and flawless, done by Nabila and team. The PR was handled by Lotus Client Management & Public Relations, Choreography and show pruduction was done by HSY (p.s loved the flawless voice, no mistakes there). Looking forward to day 2. Going to decide what to eat while I watch the Live stream ;p.